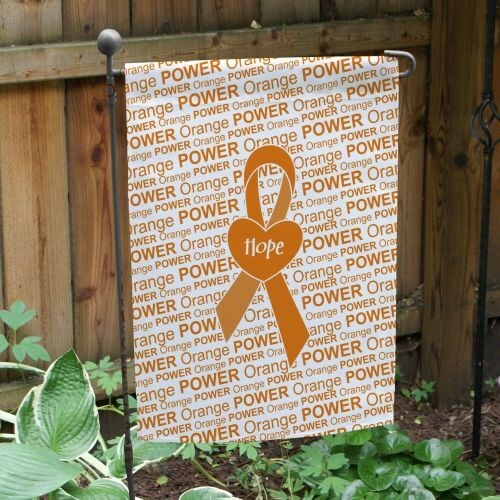 Inspire hope and courage for those who are battling MS each day when you display our awareness garden flag in your yard. No matter what the time of year, show others how important the fight for a cure is to you. Great as Multiple Sclerosis Gift Ideas for fundraisers and awareness events! This garden flag is an all-weather 100% poly garden flag. It measures 12 1/2” w x 18” h and is available with one-sided or double-sided printing. The one sided garden flag features the design printed on the front with the back being blank. The double-sided printing features the same design printed on both sides. Available for an additional fee. Free personalization of any name is included. Very happy to display the MS ribbon flag not only for myself but for all others as well! Love to show people my cause.